The College of Fine Arts at Stephen F. Austin State University will present The Purple Xperience at 7:30 p.m. Friday, Nov. 30, in W.M. Turner Auditorium on the SFA campus. 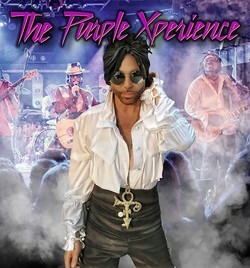 NACOGDOCHES, Texas - Tickets are selling quickly for The Purple Xperience, the most authentic Prince tribute show in the world, coming to Stephen F. Austin State University on Nov. 30 as a special Encore Event to complement the SFA University Series. A presentation of the College of Fine Arts and sponsored by Lehmann Eye Center, The Purple Xperience is a five-piece group that transports the spirit and sound of Prince direct from Minneapolis. Front man Marshall Charloff, who once recorded with Prince, channels the vocals and moves of the critically acclaimed icon in an unmatched, uncanny fashion, from his appearance to his multi-instrumental capacity, according to Scott Shattuck, associate dean of the College of Fine Arts and director of the University Series. "Marshall Charloff styles the magic of Prince's talent through his spot-on vocal imitation and brilliant performance on guitar and piano," Shattuck said. "This is going to be a full-on rock concert that no one will want to miss." The Purple Xperience has entertained well over 300,000 fans and shared the bill with The Time, Cheap Trick, Gin Blossoms, Cameo, Fetty Wap, the Atlanta Rhythm Section and the Detroit Symphony Orchestra.